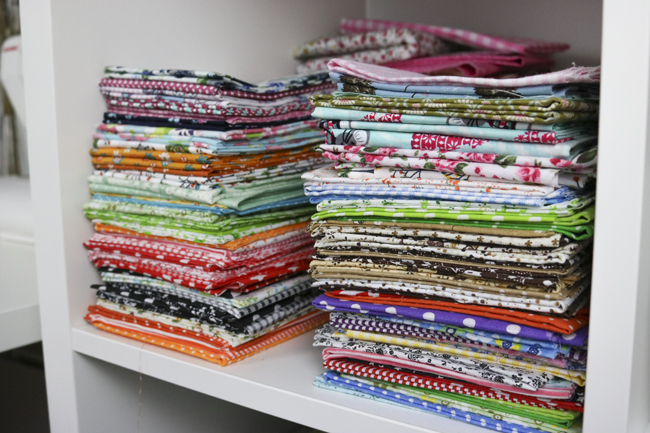 Tilly and the Buttons: Sewing Space Tours... Hayley's Girly HQ! 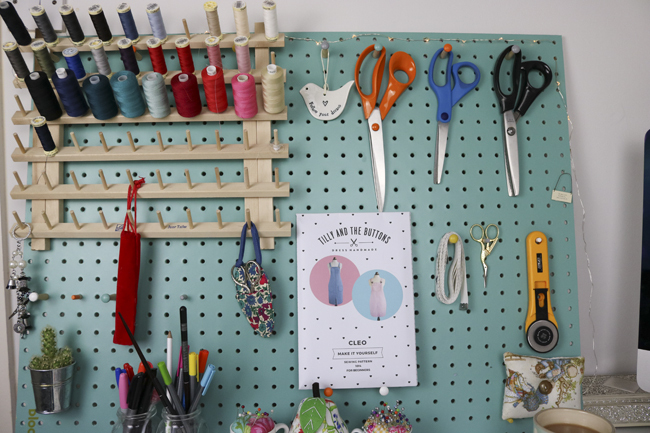 Sewing Space Tours... Hayley's Girly HQ! Hey! 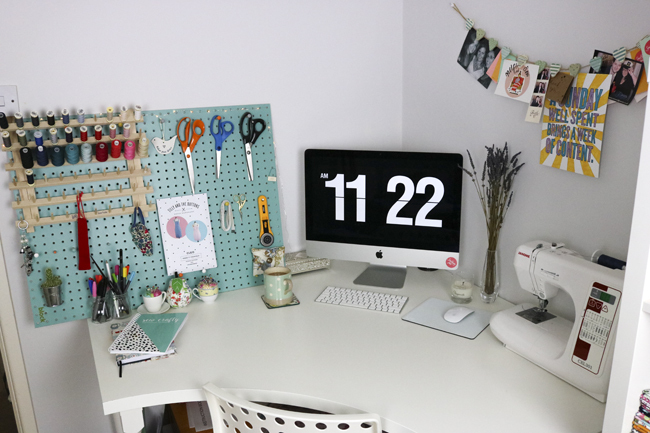 Welcome to my little sewing room! 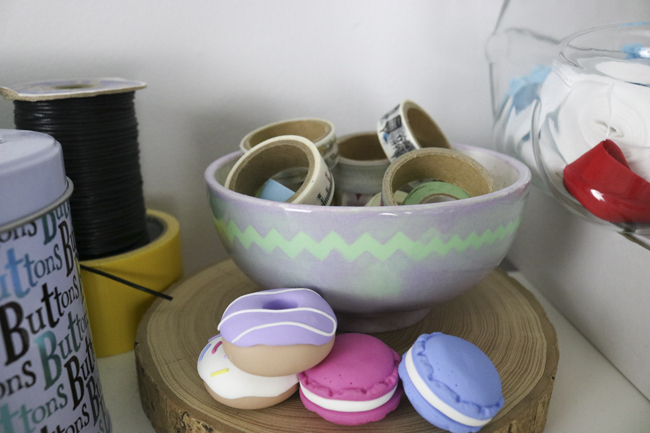 I’m Hayley and you can find me here most days either working on my sewing subscription box company SewHayleyJane, which involves planning each box, vlogging, blogging, writing emails, posting to Instagram... or sewing!! Working in this little space definitely makes it very enjoyable. I live near Winchester in Hampshire with my husband Andy, but due to renting our house, it’s a pet-free zone. 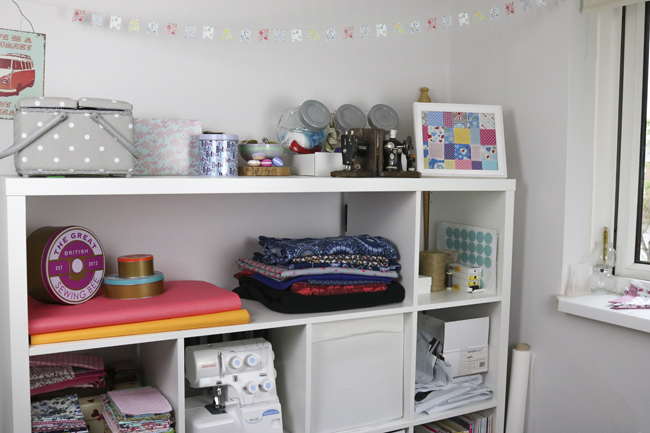 As soon as we moved in, this room had my name on it as my sewing and craft room, and I’m very lucky to have a dedicated space where I can be as girly as I like, and cover the walls with bunting and fairy lights! All of my furniture comes from Ikea. I customised the big square shelving unit, by taking out two of the dividers to make one longer shelf for storing more fabric, as well as my packaging supplies. 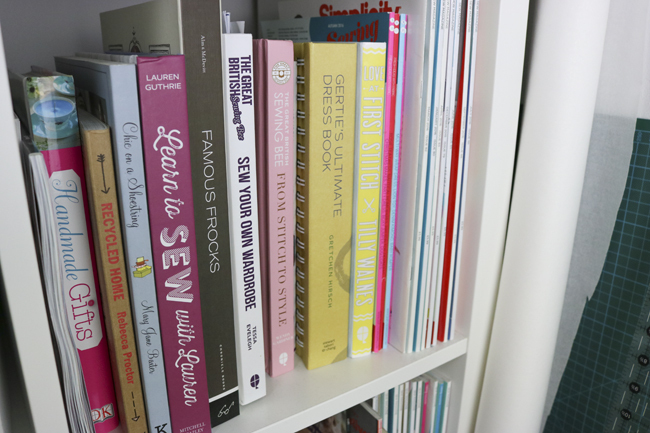 As well as fabric, the shelving unit also houses all my patterns, books, and magazines, as well as all those odd bits of interfacing and tracing paper that are useful to have to hand. There is, of course, also my super stash of fat quarters. They’re so colourful! Above my desk is my gorgeous peg board from Block Design which was a leaving gift from my old place of work. It currently holds my growing collection of scissors as well as my thread rack (which clearly still needs filling!). I change things up on this board regularly so it’s still a work in progress. The rest of the room is filled with bits and pieces that have been collected, made, or gifted to me over the years including my vintage sewing pictures, and my lovely Liberty paper garland. I also have a little bowl on top of my shelves that I painted at a pottery painting party for my best friends Hen Party. It’s such a fun thing to do, if you ever get the opportunity to try it. I absolutely love spending time in here sewing up a new project on my Janome CXL301, which was a Christmas gift from my family. Typically, the business takes up most of my time, but when I do get to sew for fun I usually listen to Radio Two or to podcasts. Some of my favourites are The Goal Digger Podcast and Hashtag Authentic. I definitely recommend these to anyone who runs a creative business and communicates with their fabulous customers on social media. 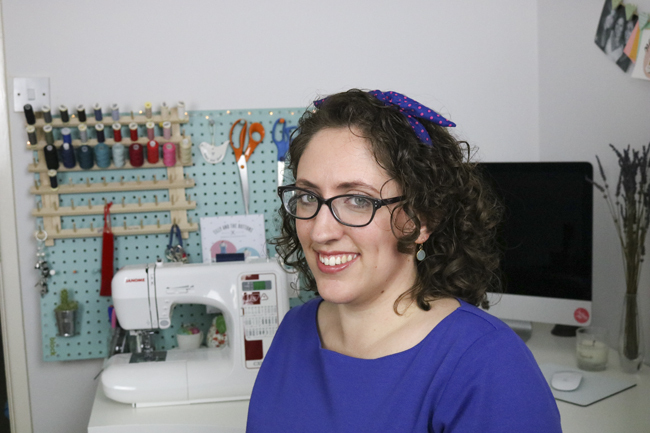 For sewing, I love Maker Style, particularly Rachel’s interviews with those in the sewing community. There’s also always a cup of tea on the go! 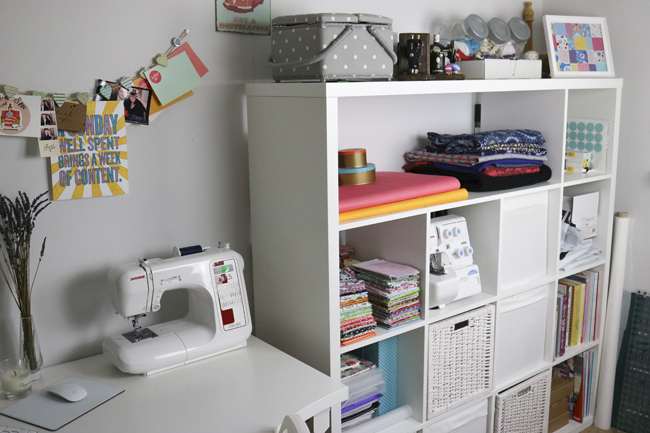 When I planned my sewing space, I used Pinterest a lot for inspiration and knew that I wanted it to be a bright and fairly modern space with good storage. 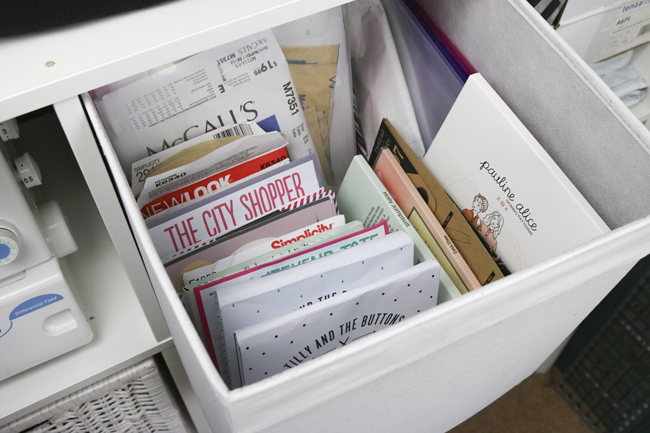 I hate too much clutter and have to start most weeks with a bit of a tidy up, so having drawers in the shelving unit is great… out of sight, out of mind! We are thinking about moving house next year and one consideration will be the need for a decent sized office. A converted garage would be ideal, as one thing I definitely need is a proper cutting table. If anyone knows where to get one do let me know! (You’re in luck, Hayley – Tilly’s written a blog post about how we hacked ours from an Ikea kitchen table!). For now though, this is my happy place and I hope you have enjoyed having a good nosey! What a clear, uncluttered space, the perfect place to let creativity bloom. Thank you for sharing with us, Hayley! (UPDATE - since the time of writing, Hayley has informed us that she's moved into an even bigger space - the lucky thing!). 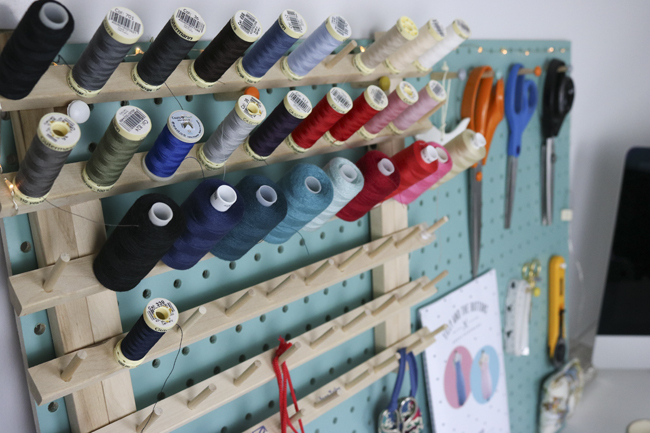 Have you seen the other gorgeous spaces in our Sewing Space Tours series? Check them out here. Wanna submit your space for consideration to be featured on the blog? Have a read of our submission guidelines. Looking forward to seeing your spaces!